Daily Devotion On Fire: DAY 831 - The Power of Making Music to Praise The Lord! DAY 831 - The Power of Making Music to Praise The Lord! **NEW link for the 9th 100 days 24 hours prayer campaign (from Oct. 30, 2011 to February 5, 2012). to the music of the ten-stringed lyre and the melody of the harp. What I received from Jesus today is: The power of making music to praise the Lord! Do you understand the power of making music to praise the Lord? Have you experienced the power of making music to praise the Lord? Do you enjoy making music each day to make music to praise the Lord? 1. 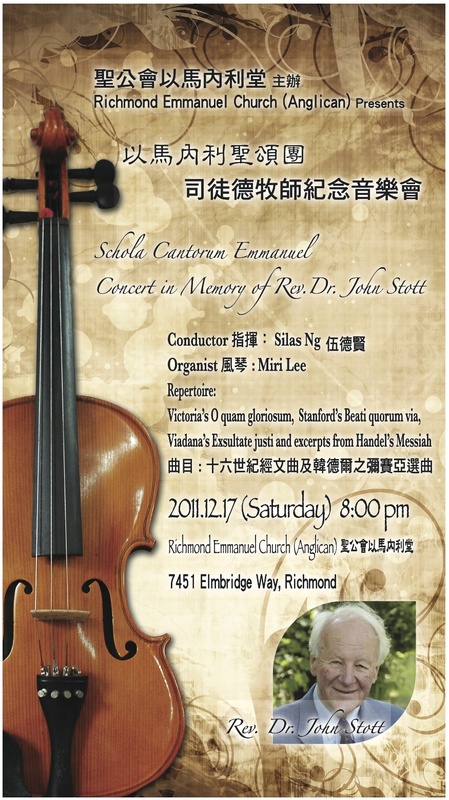 An invitation: It was a direct invitation from the Lord in 1997 asking me to use my gift of music to promote good classical choral music in Greater Vancouver. 2. A way of training: It is a good way of training to those church choir conductors and members who are Schola members to acquire better skills as conductors and choir members. 3. A rest for me: Every time after two hours of rehearsal I always like a deep massage in my brain and my spirit is being uplifted by the power of making music to praise the Lord. Actually quite a number of times I was in the condition as in verses 6 to 11 of being attacked by wicked but because of those rehearsals I got out of those dark hours and being uplifted into His light. I do hope and pray that you can try your best to make music to praise the Lord in anyway you can. If you are in Vancouver I do hope that you can come to our coming concert on December 17, 2011. Let's give thanks to the Lord for what John Stott had done to enhance God's Kingdom and let's make music to praise the Lord! Help us to know how to make music to praise you daily. Jesus name we pray. Amen. **Bishop Nathan has confirmed that he will come to be one of the main speakers of our next year's 3rd National Conference. We are going to have Archbishop Yong and Julia, Bishop Chuck Murphy and Dr. Terry Walling as the other three main speakers. The date of the Conference will be decided in one month's time but most probably will be around mid-October. DAY 833 - Pay Back Time! DAY 832 - The Lord Reigns! DAY 830 - How Much Do You Love Him? DAY 829 - Life Is Short, Pray Hard! DAY 827 - Darkness Is My Closest Friend! DAY 826 - Pray for Jerusalem! DAY 825 - Give Me An Undivided Heart! DAY 824 - Restore, Revive, Rejoice! DAY 823 - Where Do You Spend Most of Your Time? DAY 822 - When God Keeps Silent?! DAY 821 - Play God but Not God! DAY 820 - God Is Not My Cup of Tea! DAY 819 - Enter into A Revival Right Now! DAY 818 - Taste the Bitterness of Rebellion! DAY 817 - Never Repented until God Killed! DAY 815 - How Great Thou Art! DAY 814 - It's OK to be A Loser! DAY 813 - How to Deal with Rejection? DAY 812 - Jealousy, Watch Out! DAY 811 - What Now? DAY 810 - Leave A Legacy! DAY 809 - They Say Aha, We Say Abba! DAY 808 - Do Not Join Satan's Team to Destroy! DAY 807 - How Can You Welcome Your God And King? DAY 806 - How Can You Know God's Plan? DAY 805 - Tested, Blessed, Offered! DAY 804 - Dinner in Jesus Home!